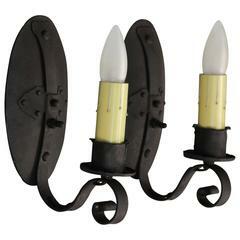 Beautiful and stately 1920s wrought iron two-light sconces. Hard to find high quality pair. Salvaged from local Los Angeles home.
. 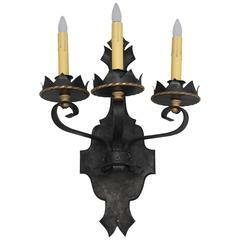 Larger scale Spanish Revival sconces with three lights. Measures: 30" H x 21.25" W x 13.5" D.
Wrought iron sconces with nice simple and strong design, circa 1920s. 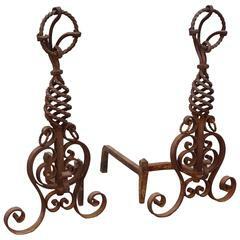 Hand wrought iron andirons with ornate detailing, circa 1920s. A very nice set of four sconces, they have been restored. These handmade sconces are quit heavy, the quality is there, the patina is much nicer in person. A rare pair of large 1920s cast iron sconces, they have been restored, they are quite heavy. An elegant set of four wrought iron sconces, the patina is much nicer in person, price is for the set of four. 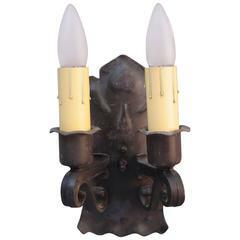 Rare pair of 1920s outdoor sconces, that size is quite rare. A very nice set of four 1920s cast iron sconces, they have been restored, price is for the set of four, we can sell them by the pair.